When it comes to home cooking, Mark Bittman’s recipes are my favorite. He’s covered all the basics, food recipes from all over the world, local and whole food eating and on and on. I bought his Kitchen Express in a second-hand bookstore, and it’s been one of my best buys (and I’m an avid bargain hunter). One of the things I like best about the book is that he forgoes formal measurements and actually encourages flexibility in the home cook. Usually, when I read a new recipe, I get discouraged when I realize I have to buy 3 or 4 new ingredients (especially since I’m living on the budget of a poor grad student), but Bittman is the king of substitution, within reason of course. Plus, he assumes that you know what you’re doing in the kitchen and doesn’t spend a lot of time walking you through every little step. 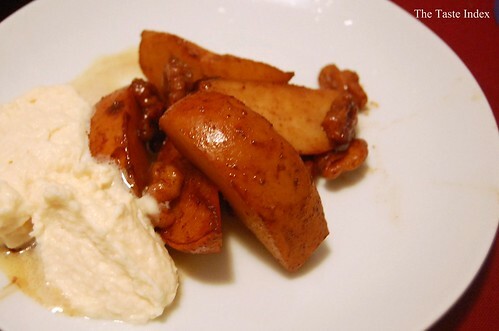 His recipe for caramelized pears with mascarpone is a prime example. It’s quick and easy but refined enough to serve as a dessert when company’s over. Slice a couple pears (I like Bartlett variety) into wedges and toss with a few tablespoons of light brown sugar and a teaspoon of cinnamon. 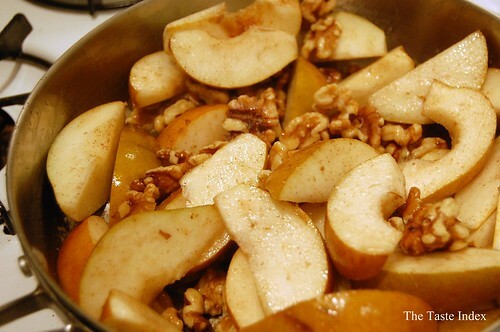 Heat a couple tablespoons of butter; cook the pears and a handful of walnuts until the wedges are a bit soft and the walnuts are glossy, about 4 to 5 minutes. Whip together a third of a cup of mascarpone, a couple tablespoons of heavy cream, and a tablespoon of sugar (you can also add a tablespoon of good brandy), until thick. Serve the warm pears with the cream mixture. You are currently reading Caramelized pears with mascarpone cream at Notes on Food.